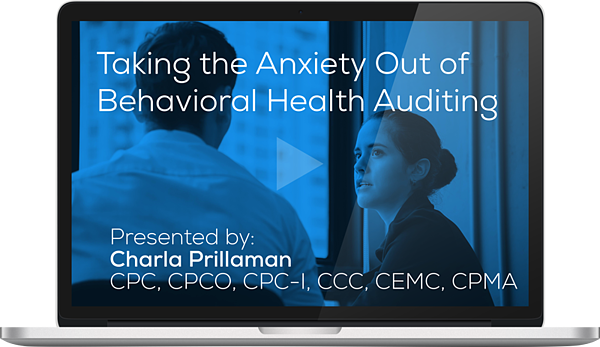 Easily Tackle Behavioral Health Auditing. You sit down and feel your jaw tighten, your pulse quicken, and your shoulders cramp up like you’ve slept on a boulder all night. The project you've been dreading is right in front of you, right there, and there’s no escape because you’ve got a deadline and you’re a professional. You remind yourself that all of your peers feel exactly the same way when faced with the task to audit behavioral health services. “I’m a warrior,” you whisper, because plenty of expert auditors avoid these services like the plague, but not you. Not today. A few years back, the AMA changed the codes and guidelines. The changes allow medical providers to bill for E/Ms in combination with therapy codes. Non-medical providers, such as social workers, are not able to bill E/Ms and there are specific guidelines on what therapy CPT® codes they can bill for. In addition to this change, AMA revised their rule for time-based therapy services. For example, there must be specific elements documented along with the time AND the time can be rounded. This is often a concept that coders struggle with. BH auditing is very different from any other specialty and that’s why it can cause so much anxiety in even the most outstanding auditing professionals. This program meets AAPC guidelines for 1.0 CEU. It can be split between Core A, CPCO, CDEO, and CPMA. On-Demand views require successful completion of post-test for continuing education units. You will receive your CEU in a separate email after watching the on-demand recording.